Shanelle Newton Clapham explores how to use Search to find those people who are already looking for you. 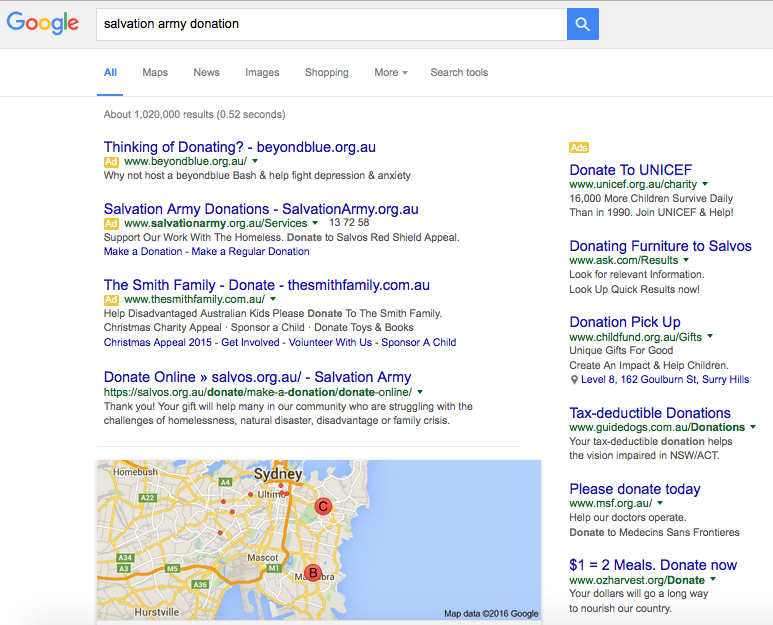 Search isn’t the sexiest of the digital fundraising channels. But when done right it delivers the best Return on Investment (ROI) and it’s a not-for-profit organisation’s biggest opportunity to reach new people online. Not only do over 80% of internet sessions start with a Google search. People using search engines know what they want and are looking for it. For them to find you, you must have the content they are looking for. And that is a piece of information – not your organisation or brand. For example, “Salvation Army donation” (see Figure A) is the search term that gets the best conversion rate and the highest clicks and donations for one of Parachute Digital’s well-known homeless charity clients. But they’re not The Salvation Army – they’re a competitor. Despite the fact the user was actively searching for The Salvation Army, they have donated to another homeless charity because its search ad was the best match to their query. So search is a great opportunity for charities to find and convert new, like-minded, qualified audiences. Figure A: Multiple charities bid on the keyword “Salvation Army donation”. The aim of any search strategy is getting your organisation or brand on page 1 of Google results listings for your desired keywords. With organic search or search engine optimisation (SEO), Google ranks websites by how relevant their content is to a user’s search query. Content quality and relevancy is also important in paid search or search engine marketing (SEM), but your budget matters more. As Google has over 90% market share in Australia, I recommend you invest your time and money in Google AdWords. If you haven’t yet, apply now for the $10,000-a-month Adwords Grant Google offers not-for-profits and charities meeting its criteria. And learn to use it, for example via Parachute Digital’s courses. List keywords relating to your website content – specific keywords for each page you want searchers to click to. Grow and refine the list based on what converts best and what may waste your precious budget. Create your search ad text. Clicks are more likely if the description includes the keywords people type in. Tip: Use First Letter Capitalisation For Every Word In Your Ad Text (see Figure B). Figure B: Good ad descriptions include key words and capitalisation. Where your ad ranks on a Google search results page depends on the maximum cost per click (CPC$) you’re willing to pay for any given keyword. You can choose a cost per campaign, or a per click bid for every keyword in your search campaign. Google scores every ad on quality. This measures your CPC$, your ad text relevancy to the keyword, your click through rate (CTR%) and landing page bounce rate. So only create ads that click through to relevant webpages or your quality score will suffer. Success is when your campaign generates more revenue than it costs. This requires constant optimisation – monitoring your keywords and ad text, and comparing them to your competitors. Be packed with the keywords your prospective supporters type into Google. Satisfy the specifics Google is looking for, so your website outranks competitors vying for clicks from the same keywords. Download Parachute Digital’s SEO Checklist for more details. 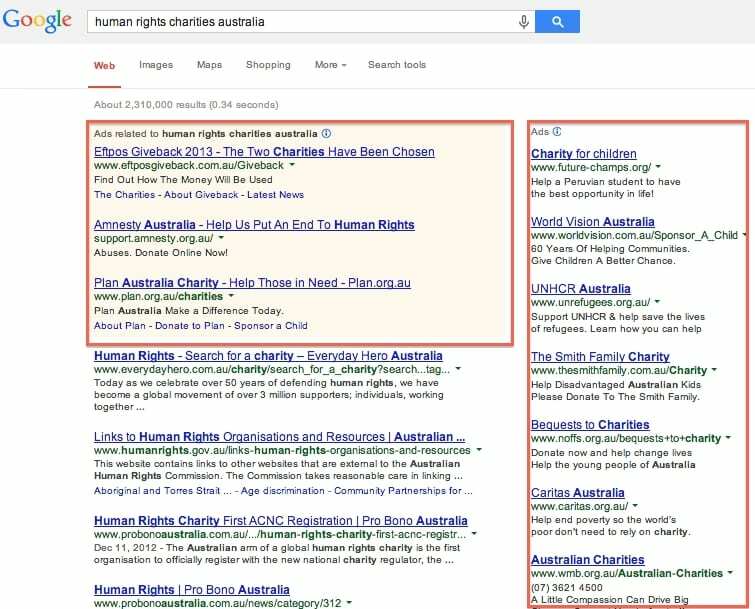 You can get accurate Australian search data for your keyword research using the Keyword Planner tool in Google Adwords. Check exactly what people type into Google when they’re looking for you and the volume of searches for every keyword. Then create content that meets their needs. 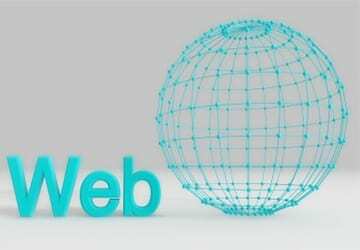 Next to quality content, your website needs three kinds of links: inbound (these point to your website from other separate websites, and act as recommendations); internal (directing users within your website) and external (sending users from your website to other sites). A title and description summarising your page content (meta data) is what shows in Google search results. This must be unique to each page. SEO and website content are long-term strategies needing constant refinement and optimisation. But this is one of the most cost-effective online marketing strategies – when it’s done right. 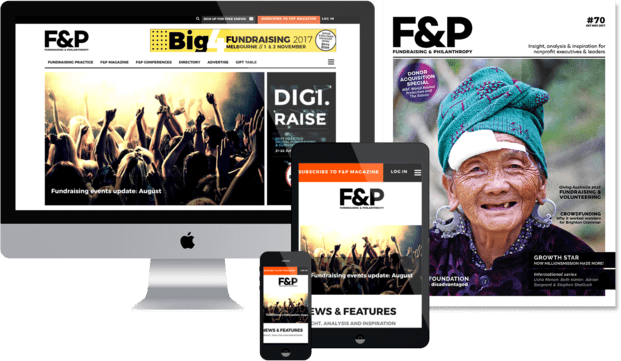 Shanelle Newton Clapham is Founder and Chief Digital Strategist at Parachute Digital, that works exclusively with not-for-profit organisations helping them make more money online and give their supporters an excellent experience. www.ParachuteDigital.com.au. Image courtesy of Salvatore Vuono at FreeDigitalPhotos.net.